Wow... it's hard to believe that it's been over a year since Daisha's baby shower, and almost a year since I met baby Naomi! Well, she's not a baby anymore! Naomi's first birthday party was today. I asked Daisha if she had any gift requests. 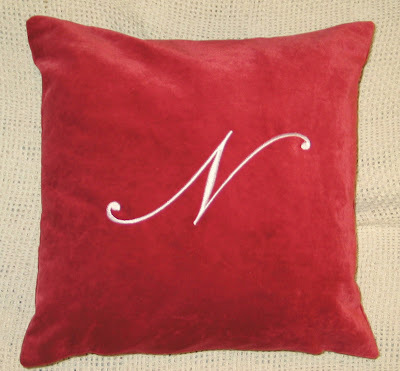 Gideon has a pillow that he loves, and Daisha had bought fabric to make a similar one for Naomi, but hadn't gotten around to it. I took the fabric and made it for her! 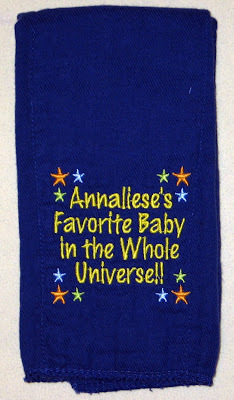 This morning I stitched a burp cloth for me to use. 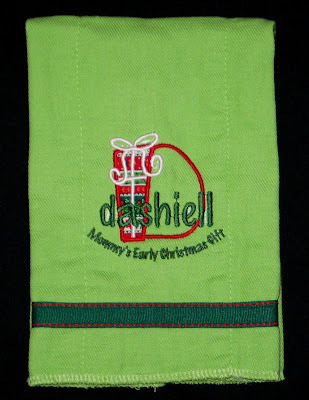 Thanks, Dashiell, for being my early Christmas gift! 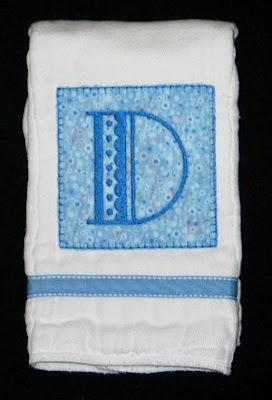 The monogram is Five Star Font's Gift Box Applique Font. I added the rest of the text with Embird Alphabet #8. 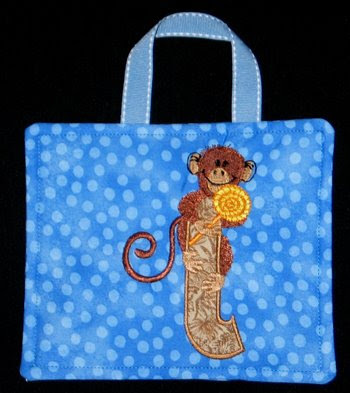 Michelle ordered a pencil roll for her nephew's birthday. She thought Chase could use it while writing and drawing during church service. What kid wouldn't like that? 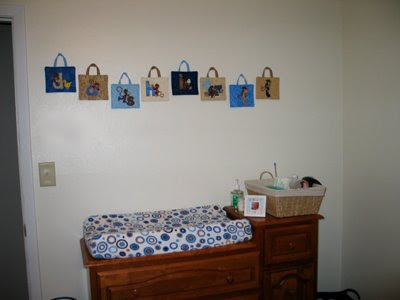 Annaliese uses her crayon, pencil and marker rolls every Sunday! 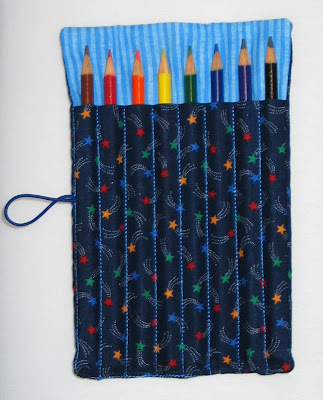 The pencil roll design is from Sewing For Sarah. 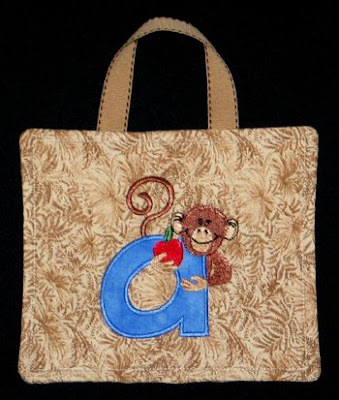 I used Embird Alphabet #8 (can you tell that's my favorite??) for his name. 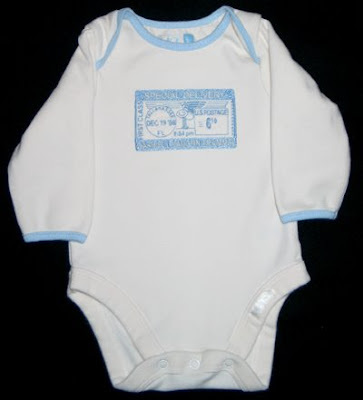 The white bib is monogrammed with Five Star Font's Whimsy Dot. 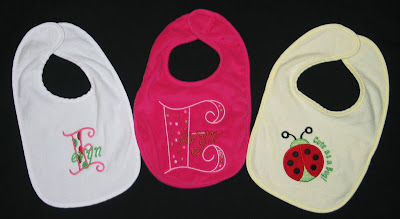 The pink bib is monogrammed with the Dot Alphabet from Julia's Needle Design. 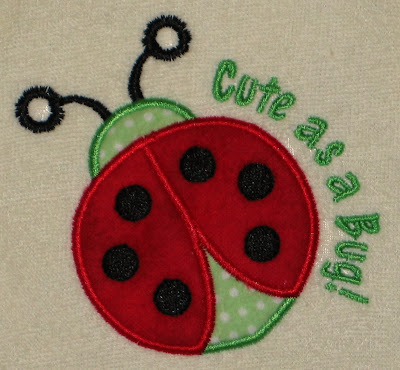 The yellow bib has an applique ladybug from Pegboard Crafts. I added the text with Embird Alphabet #8. I'm still making my way through the leggings/shirts that Kathy sent us in April. I think these are the last pair of striped leggings. I love them! 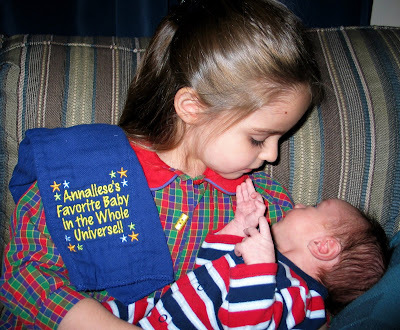 Here is Annaliese's Quilt block shirt. 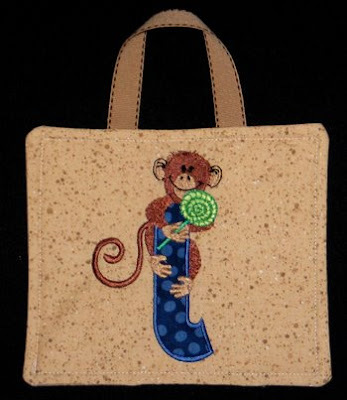 The design is from Adorable Ideas. Some time last year I got my choice of a free design set, and I picked the Americana Quilt set, which this is from. 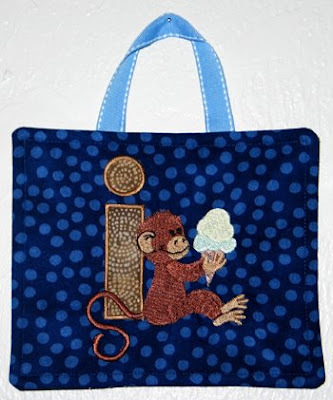 I think it looks cute in pink and turquoise too. 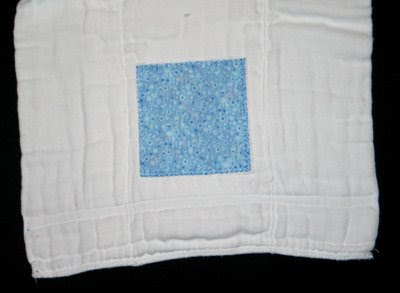 My only regret is not paying closer attention to the type of stitching around the squares. 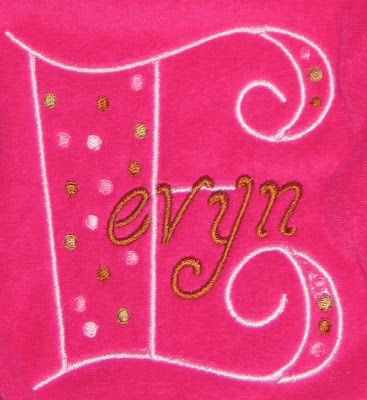 If I'd realized it wasn't satin stitches but instead overlapping zigzags, I would have used turquoise thread for the tackdown on those squares... the pink shows through. Oh well... I have to continually remind myself it's just for a four year old. Pardon me, four-and-a-half year old. She didn't notice and was pretty pleased. Favorite Baby in the Whole Universe! 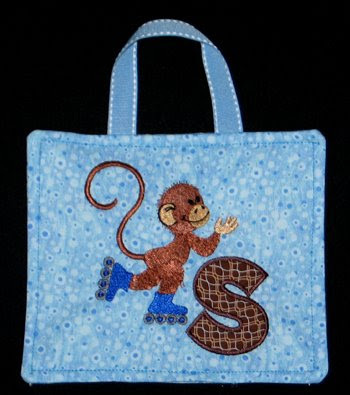 I used Embird Alphabet #8 for the text, and the stars are from an embellishment set from Sew Crazie Designs. And here it is in use. We also took it to church so she could have it as she held him there. Dashiell blessed me with a cheerful and alert photo shoot today. I couldn't pick a favorite shot, so you can see them all. None of the fabrics used are actually in his bedding set, but I used fabrics from both the quilt I am making and the quilt my mom made Dashiell. I think that makes this decoration tie everything together nicely. 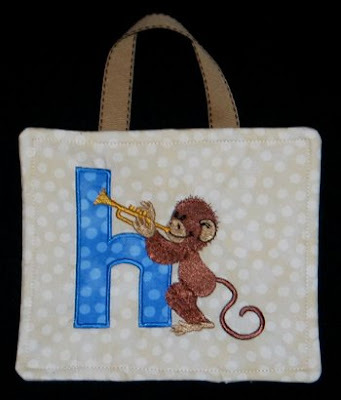 Here are close-ups of each letter. To construct the wall hangings, I created an in-hoop design. 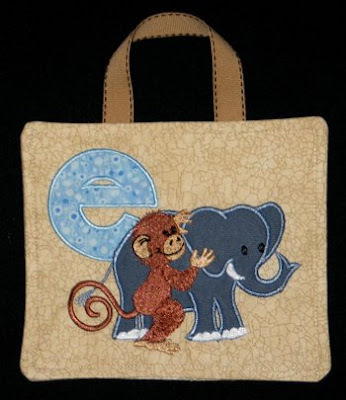 First I stitched the monkey design, then I tacked down the ribbon at the top, laid down the backing fabric face down with a layer of batting, and stitched an almost complete rectangle. After removing it from the hoop and trimming the edges to 1/4 inch, all I had to do was invert the mini wallhanging and top stitch around the edges. I had to work out some kinks on the first two, then the rest went together very smoothly! 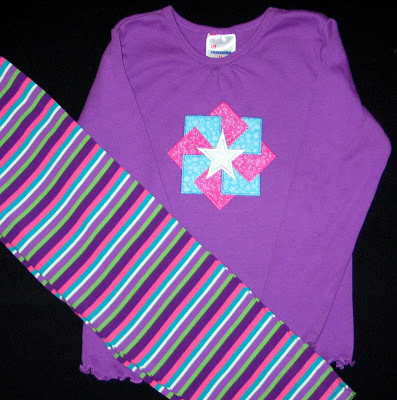 The design is from Sew Many Designs. I didn't have any cute prints in my fabric stash that matched the jade colored stripe in the pants, so I used a solid for the mittens. To compensate for boring fabric I used variegated thread for the stitching. 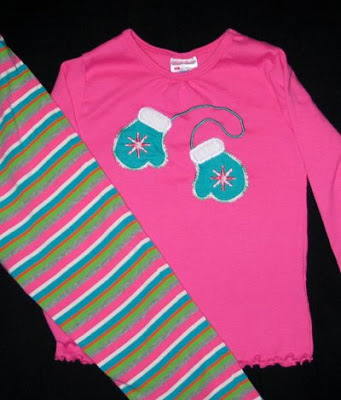 I used minkee for the cuffs on the mittens, which Annaliese loves. 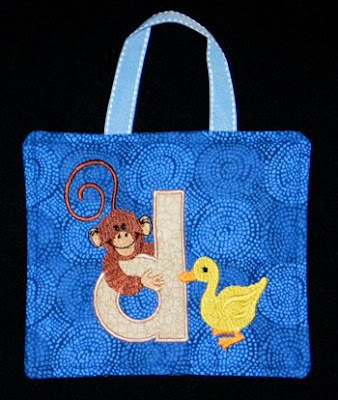 Up next: Q is for Quilt! 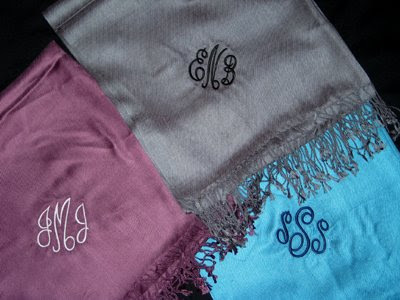 Beth had asked if I could monogram some Pashmina scarves for her to give as Christmas gifts. We didn't actually end up getting together to figure out placement and pick threads until the evening of Dec 18. She was very understanding of my pregnancy and said not to worry about rushing to get it done. However, at that moment I felt perfectly fine and since I thought delivery was a ways off, I figured I could get them done within a day or two. 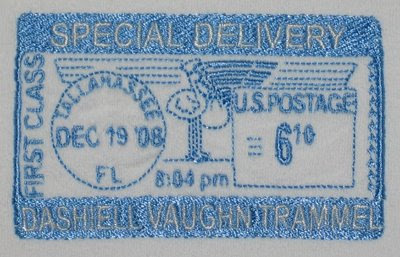 In fact I stitched one of them that night so Carlin could take it to work the next morning and get her approval before doing the rest. Well, that was my plan. Dashiell had other plans and made his debut 24 hours later. (Carlin says it's because Dashiell heard all the fun Beth and Annaliese were having and wanted to get in on the action.) 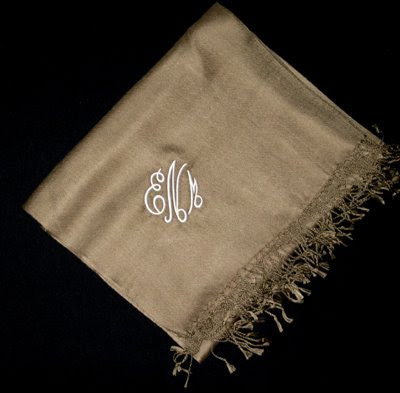 We did swing by Carlin's office on the way to the hospital the next morning to drop off the first Pashmina -- I knew of the four it was one that had to be shipped and since it was done, Beth could at least have one gift arrive in time for Christmas! I finally returned to the Pashminas this week and completed them last night. 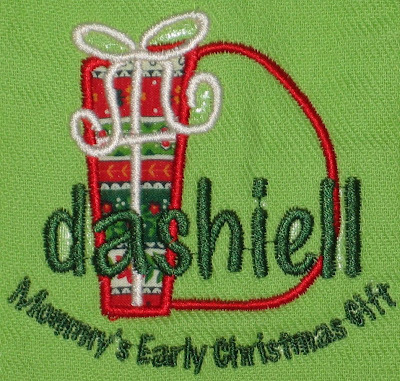 I used the Empire font from Embroidery Arts on each of them. 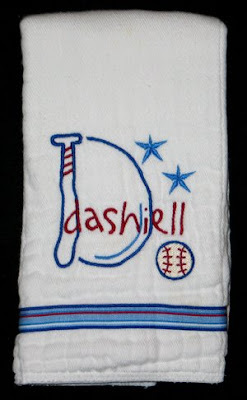 Here are a couple burp cloths I stitched for Dashiell before he was born; I'm just now getting around to posting them. The next was an experiment, covering up an error I had made on a previous order. 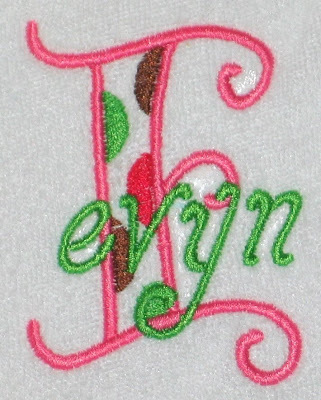 The first time I had made this burp cloth with Kyleigh's name on it, I accidentally switched the i and e. It would have been too much work to pick out the letters, so I just started over, saving the cloth diaper for later. 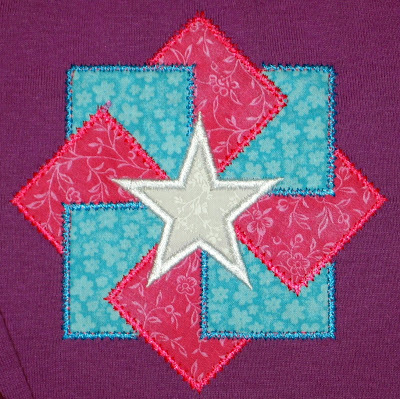 My solution for covering the pink and green stitching was to put an applique patch over it. 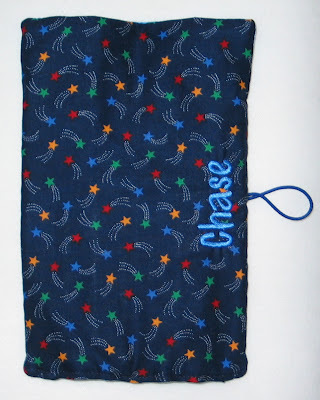 I tacked down the fabric, stitched the D (8 Claws and a Paw's Dot Alphabet), tacked down a square on the back, and finished it off with a blanket stitch. 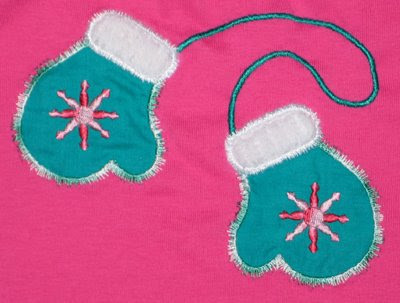 My only regret is not using a thicker fabric -- if you look close you can see some pink and green that shows through. But I was glad to know my experiment worked, and should I ever make another mistake, I have a way to save the cloth diaper!